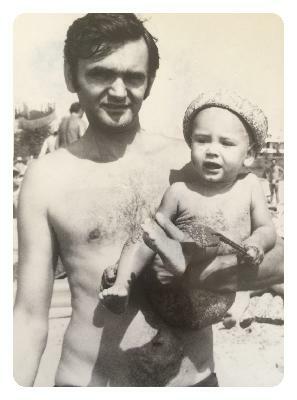 “My life has been an elegant party,” is what my father-in-law, Mircea “Vatti” Ciortea, said to me when we last spoke just weeks before he passed away in October. Knowing there was nothing I could do to help him and knowing my family would need our friends, I signed up with Moving Day® Silicon Valley. As Team Leader for “Little Devils” I sent out a request to friends, family and colleagues to support Vatti, my husband Marius, and our family with words of love and support. I chose the name Little Devils because our last name Ciortea (choretayuh) means just that, Little Devil! After only a few short weeks we quickly exceeded our initial fundraising goal of $1500. Wanting to surprise my husband and father-in-law, I secretly compiled a short video of supporters. When my husband went home to be with his parents, I sent the surprise their way. What Vatti said to me was breathtaking. He told me that, “seeing the faces of the people in my son’s life, knowing that you are not alone, knowing the goodness of those in your lives…” put him at peace. We will be forever grateful to our friends and team Little Devils for making that gift a precious reality. In the months leading up to the walk we will continue to ask for support and are putting together our own fundraising event. Vatti was born in Romania, living under the oppression of communism, defected to Germany while believing in the American Dream. As a family we drank coffee, enjoyed museums, listened to jazz, and experienced life together. He was a highly educated, political philosopher, jazz lover and book worm who had a passion for life. An absolute intellect, he was a product of the “Mad Men” generation, yet believed, supported and respected me and my opinions. That always meant so much. His love was infectious and thankfully our son, Constantine, carries much of his likeness. Vatti, was a brilliant doctor, who until the very end, continued to stay current. Consuming new studies and attending conferences. He always believed there was something new to learn. His curiosity was astounding. He read everything he could about Parkinson’s. He fought with a vengeance. He rode his stationary bike religiously for 30 minutes a day. He walked, and went out. Nothing stopped him. My father-in-law will live on in the hearts of my family. While we miss him terribly, I imagine he is THRILLED that so many people have come to support something I started in his honor. Together with NPF, the Little Devils are making a difference. We are helping to fight for an END to Parkinson’s disease and giving folks a chance for a better quality of life. I refuse to let this cause be a sad and morose situation. While we have lost Vatti, we can help future generations and have an enjoyable time doing so. Please, join us at Moving Day® Silicon Valley. The more Little Devils the merrier! CLICK HERE to join team Little Devils and see their walk page.